The U.S.S. 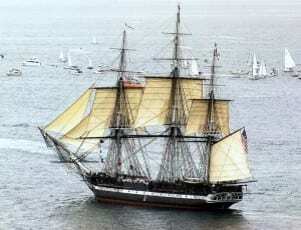 Constitution set sail Sunday for the second time in 131 years. “Old Ironsides” left her dock in the Boston Harbor for about 17 minutes on her own power for the second time since 1997, the previous time being in 1881. 285 people were aboard the ship that once it reached President Roads in Boston Harbor, was let go by tugboats and free to sail on its own at a speed of 3.1 knots. The ship returned to pier after 2p.m. and reopened for public tours by 4 p.m. The sailing of The Constitution was a historic moment in the lives of crewmen enlisted to aid in the excursion. In 2015, The Constitution will undergo restoration work in which the vessel will be placed on stilts out of water. Previous ArticleWillie Nelson cancels gig after breathing troublesNext Article"Live with Kelly!" and who?